Styled with zach pant and vin cashmere cardigan . Fits true to size. 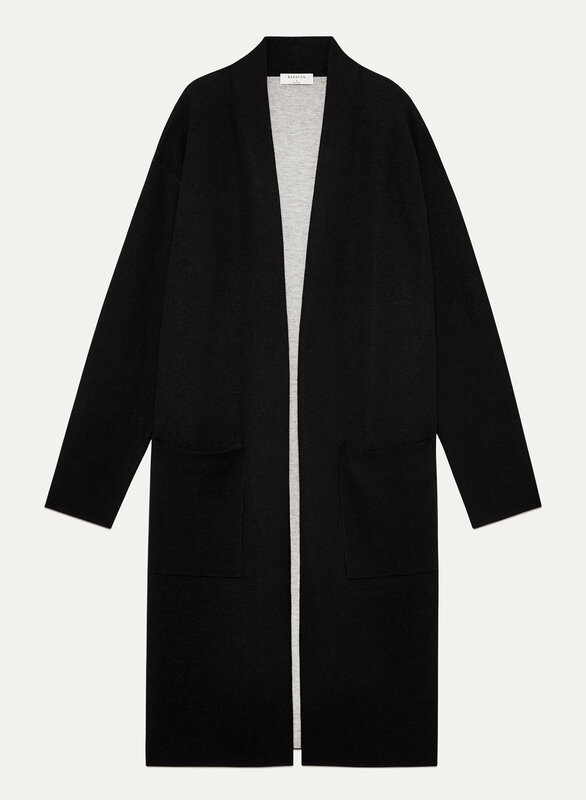 A versatile cardigan that you can dress up or wear casually with jeans. Really great piece! 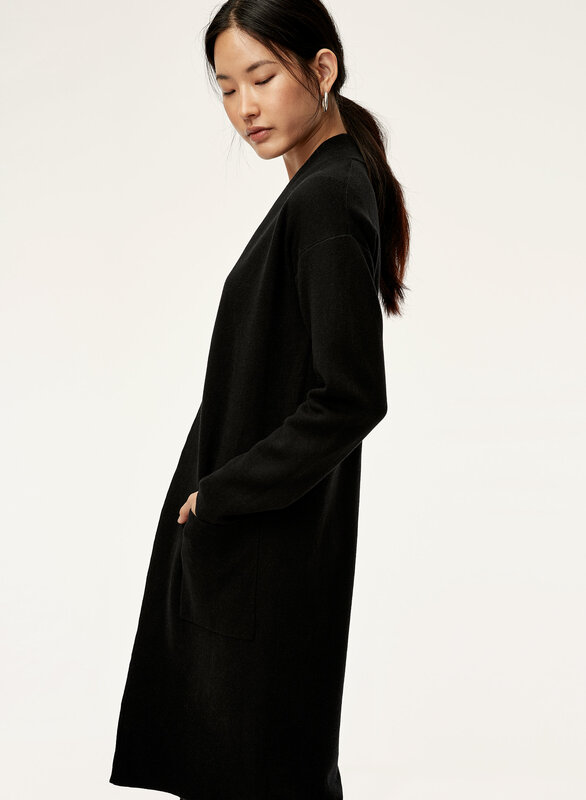 The perfect long black cardigan - it falls to around my knees (I'm 5'7"). Love the different interior/lining colour, it makes the cardigan look more chic. One thing I would like to note is that it is prone to dust and it shows more on the black colour. This can be fixed with a lindt roller but something to keep in mind for storage/wear! Beautiful cardigan, order a size down! This is a beautiful, simple cardigan that unfortunately fit much larger than a medium. The arms and sides are quite wide. However, the exchange in-store was very simple. I love the size small, although the sides don't fully close in the front - this may be the style. Overall would recommend! Got the camel color. Nice basic piece to add to wardrobe, a bit scratchy so I wear a long sleeve shirt underneath. I’m 5’2, about 140 lbs and the length is just below the knee. Love the deep pockets. I love the look of this sweater, you can dress it up or dress it down. I love the colour and the fabric.Sophisticated,I love it! I absolutely adore this cardigan. It is sleek and chic looking while still being super comfy. Can truly dress it up or down. The one downside is the material- it piles really easily, despite taking it only to a trusted dry cleaner. I just pick the piles off but it's annoying. Timeless, classy sweater. Very slimming. Order a size down. The sleeves are pretty roomy and long. Cozy - confident in this second skin! Awesome for work or for at home! This cardigan looks great whether you dress it up or down and looks very polished. I got the black version and really love the grey inside and roll the cuffs to show it off. I love it so much that I have it in two colours and am even considering a third. I like that it holds its shape well and is soft and the perfect weight. Great fit Perfect for winter !Make a summer version ! Soft and comfortable. Length means it can be dressed up or down. Washes perfectly and doesn’t wrinkle. Own this in 4 colours! Can’t wait for warmer temps to wear as a sweater outside. Very comfortable but fit larger so I sized down. It's super soft and great for Vancouver weather. Easy to match and I especially like the long length when I wear a shirt or dress underneath. One thing I do notice is that the arms area started piling after a couple wear. Nice soft and comfortable sweater. Don’t put in the dryer will shrink. Mine did 😢. Bought 3 different colors. Awesome sweater, fits true to size. Hoping it washes up nicely. I like my things fitting a bit snug so I went a size down but I would recommend sticking to your size! Or go up a size if you want it really loose. I like the snug fit with this item as it adheres to my body nicely but in a very comfortable way. Soft fabric, very cozy and would definitely recommend. I have had many compliments with this cardigan and it’s nice because it can be dressed up nicely! One of my favourite cardigans to date. I love wearing it to work and dressing it up or down. Would recommend this product overall! The double-faced wool and longer length appealed to me, but the outer wool is not as soft as the similar Beekman cardigan. However, this is not a big issue as the inner layer is still quite soft. The fabric on this cardigan is great. Warm but not itchy, sturdy and no issues with pilling thus far. Front pockets are useful and this could easily transition as a coat in the warmer months. Fit is great and flattering. Only drawback is having to handwash it. I would get another in a different colour but I’ve bought too much already. Hah! I LOVE this cardigan- it has become a staple in my wardrobe. At work or at my leisure I am always wearing this. It's warm enough to wear as a light jacket during fall and thin enough to layer comfortably in the winter! It goes with everything and easily dresses up any plain knit sweater or top.